Scrub Island is swinging its doors open this fall as one of the best or even the best all inclusive stay in the British Virgin Islands. In fact, no area is being overlooked as the owners wrap up their exciting rebranding and renovation project which is expected to surpass the property’s standing in the luxury travel market. 2017 was indeed an unforgettable year for many businesses in the Territory as two category five hurricanes caused millions of dollars of damages. Nevertheless, this disaster seems to have been the proponent for the embarkation of a game changing journey for this resort, which is ideally situated on a 230-acre private island, east of Tortola and two miles from the Terrance B Lettsome International airport. Scrub Island, which is operated by Mainsail Lodging and Development (a hospitality company that is based in Tampa, Florida) was the only major resort that was able to open for business relatively quickly following the September 2017 hurricanes. In fact, a number of the other inclusive properties are still busy with their recovery strategies, some having to rebuild from the ground up. Although, the property was not spared from the damages of the mega hurricanes it managed to balance repairs with operations up to this point and is now gearing up to unveil the new ‘Scrub Island Resort’. The present reality of turning a disaster into a success story is a welcomed undertaking for both the Scrub Island management and owners – Mainsail. The hints of the plan was presented by Mr. Joe Collier President of Mainsail Lodging & Development and by Mr. Norwood Smith Vice President of Sales and Marketing of Mainsail Lodging & Development during an interview with The Island Sun newspaper on Tuesday 18 September. 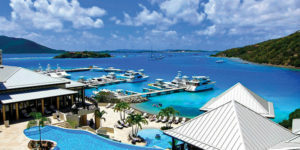 The Scrub Island Resort has always been a luxury accommodation, but Collier announced that management felt that the establishment was playing “defensive” all along. Now that things have changed in the accommodation sphere in the Territory, he said that Scrub Island is changing its gears. It is not a case of looking at the glass half empty or even half full as the management declared that Irma huffed and puffed Scrub Island into the right direction. Now with partner Ardent Capital out of Atlanta by its side the property commenced a full rebranding exercise. The Main Sail President said that in terms of service, experience, and aesthetics a number of changes are in the pipeline that go beyond just the furnishings to even include a new ferry. Every detail matters – as Mr. Smith said: instead of the usual uniformed color of the marina village, the resort will now have new tones and hues giving new personality. On the lodging front some 30 mini villas being playfully referred to as casitas are being constructed. While a number of the previously incomplete buildings/villas are almost ready for booking. As an Autograph Collection Resort, Scrub has always played in the big leagues, especially since it is the British Virgin Islands’ first Marriott International property. Nonetheless, Collier said that changes are geared towards elevating Scrub Island as a Premier Caribbean resort. He said that food and beverage would be the new star attraction as top talents from other Mainsail resorts will be brought to dazzle and wow the palette of guests. Collier explained that the changes to the menu, the revamping of all of the restaurants and other eateries on the property is in direct response to customer suggestions. He said that the most exciting feature is the changes being made to the main restaurant which will become the focal point for an unforgettable culinary experience. On the Beverage front, Scott McArdle the General Manager disclosed that not only is the wine collection expanded, but also an expert is coming to ensure that the right wine is paired and the wine-tasting events being planned are unforgettable. Service is expected to match the new additions and it was mentioned that some members of staff are being sent to Tampa, Florida to absorb how things are done there. This is expected to result in a transfer of knowledge. Great care is being taken to ensure that visitors have the best experience with an improved activity list that includes a 360 degree lookout point, a hike, an historical exploration area, and romantic evening walks that based on the description sound totally enchanting. There is an addition to almost everything, as the spa which was being temporarily housed after the hurricane is being relocated to its original spot which will now has a yoga deck. Irma brought a great big gift to Scrub Island as it was announced that the North side which was previously thick with mangroves was cleared by the force of the hurricanes. What remains is a large beach that was naturally fortified — a charming present that fits into the new Scrub Island plans. Already the beach is being added to the list of visitor experience as a pool and bar is on site and already Wednesdays are being earmarked for the weekly ‘Northside Festival’ that would have a bonfire and numerous other exciting attractions. The changes are also in reference to perception of the Resort, and both management and owner say that they want to do away with the perception that Scrub Island is closed to local events. It was noted that Scrub Island is moving away from that stereotype and is gearing up to be the venue of choice for local companies events and conferences. In fact, Mr. McArdle the General Manager explained that a special online platform will be coming on stream where BVI based residents will be able to purchase day passes and see events, and activities occurring on Scrub Island and be able to hop over to be part of experience.